There is no reason to fear naturalization process. About half of the 3.4 million legal permanent residents in California who are eligible for U.S. citizenship live in Los Angeles County, according to data from the U.S. Citizenship and Immigration Services. Of those, 504,455 are immigrants from Mexico. But a lack of information, fear and widespread misconceptions are keeping many from taking the next step and becoming U.S. citizens, said several speakers last week at a meeting where local nonprofits, the media and others were encouraged to get involved in a national campaign to increase the number of people applying for citizenship. When you become a citizen you can get a “better job, health benefits” and can be more politically and civically engaged, explained Linda Lopez, chief of L.A. Mayor Eric Garcetti’s Office of Immigration Affairs during the meeting. The goal of the New Americans Campaign (NAC) is to help legal residents with the citizenship application process by providing them with the information and resources they need to overcome the barriers and myths that could be keeping them from applying. “Language and costs are the top two” obstacles to people becoming citizens, said Elisa Sequeira, California director of civic engagement for the NALEO Educational Fund. In some cases, people mistakenly believe they have to give up their culture and cut off ties to their country of origin to become a U.S. citizen, Sequeira told EGP. She explained that applying for citizenship is a four step, 6 month-long process: preparing for the citizenship test; submitting the application and testing; background check, including fingerprinting, and finally, taking the citizenship oath. For some, the $680 application fee is a non-starter, but according to Sequeira there are fee waivers available to those who cannot afford to pay. “If you are receiving public benefits, earn 150% below the federal poverty level or you are facing economic challenges,” you can submit form I-912 requesting a fee waiver with your application, Sequeira told EGP. Newly naturalized citizen Joseph Oloimooja told EGP that he came to the U.S. from Kenya 15 years ago on an F-1 Visa for foreign students and decided to make the U.S. his home. There are really good reasons, such as health care, security and holding a U.S. passport” to become a citizen, Oloimooja said. Citizens can also vote; permanent residents cannot. Tongan native Sione Vanisi immigrated with his wife and two children to Hawaii in 1970 and three years later moved to California. “My wife encouraged me to apply for citizenship,” Vanisi told EGP. She wanted us “to take advantage of the benefits that this country gives” if you are a citizen, he said. However, like many immigrants, Vanisi wanted to be able to return to his country of birth to visit family and friends. He worried he would have to give up his Tongan citizenship, and that some would think he was turning his back on his roots. But after speaking with others in the Tongan community, he found them supportive of his decision and learned he could hold “both citizenships,” he said. Last week, at seventy-one-years of age, Vanisi was sworn in as a U.S. citizen. “I’m happy that I became a citizen, I feel the spirit,” he told EGP. 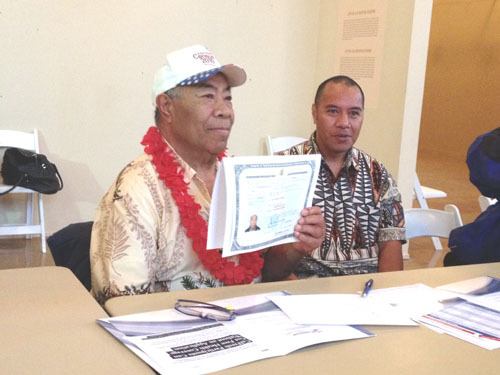 “For the first time, after 43 years [in the U.S.], Mr. Vanisi will be able to vote,” Kittione Tuitupou, a case manager at the Tongan Community Service Center in Hawthorne told EGP. “I’m very proud to help people, who for a lot of reasons don’t want to become citizens,” change their minds, Tuitupou said, adding that he accompanied Vanisi to the swearing-in ceremony March 19. The citizenship application will change on May 2 of this year. Many people have been taking classes and studying to learn the information on the current application and Nasim Khansari, citizenship network manager at Asian Americans Advancing Justice, said legal residents should take advantage of the old application while it’s still around. She said the new application, released Feb. 4, will jump from 10 pages to 21 pages in length. Fees are unchanged. There are also options for those who don’t speak English or whose health prevents them from taking citizenship prep classes. People over the age of 50 who have been legal residents for 20 years or more, and those 55 and older with 15 years as legal residents, can take the exam in their native language, according to Sequeira. They can also request an interpreter or take someone they know with them to the immigration interview so they “feel more comfortable,” she said. People who suffer a medical illness, such as a stroke, that prevents them from learning English or U.S. history also have options, said Sequeira. “Their doctor has to fill out form N-648 and explain the medical condition and how it affects his/her learning.” They could be excused from that part of the interview, she said. It’s time for immigrants to stop being afraid or continuing to make excuses for not becoming a citizen, Sequeira said. “We took a great risk by coming to this country, we shouldn’t be afraid to take an exam that will take less than 30 minutes,” she said. Must be a legal permanent resident holding a green card for at least five years. Must have continuous residence in the U.S. for at least five years, or three years if married to a U.S. citizen. Citizenship application workshops and classes are happening throughout L.A. County. To find one near you, call (888) 839-8682 or visit www.newamericanscampaign.org for more information.